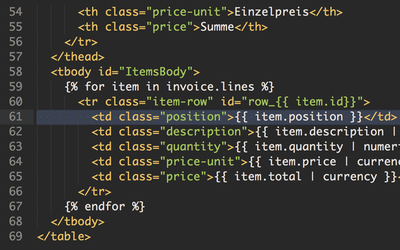 Integrated with Redmine Products plugin. 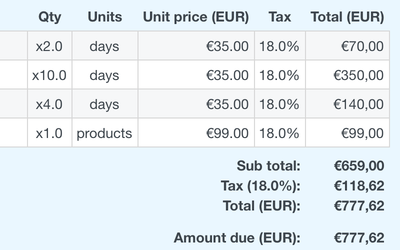 [Products at Redmine.org] [Products – developer's site]. Start using invoices functionality for your business to ease your clients' payment history monitoring. 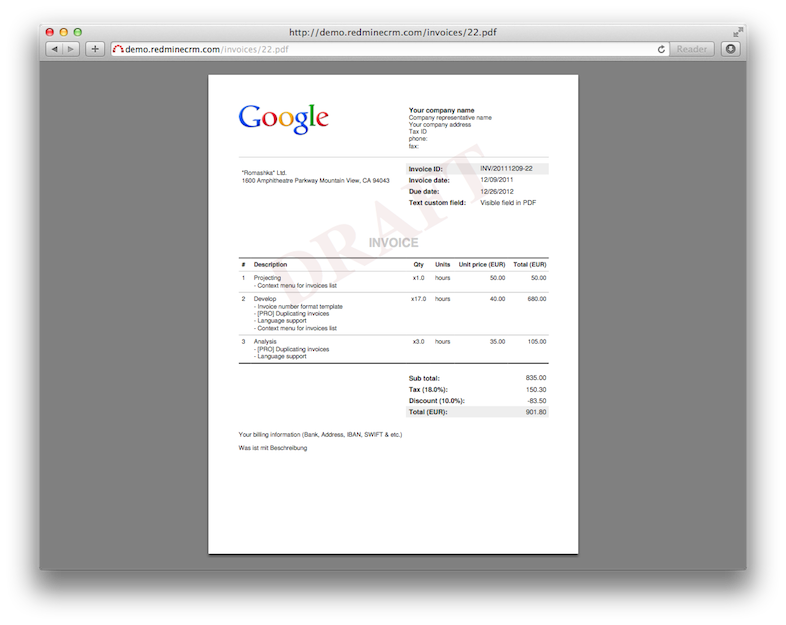 Once you created invoice, you can generate, download and send pdf-report to your client. This plugin allows you in standard to create estimates or quotations. 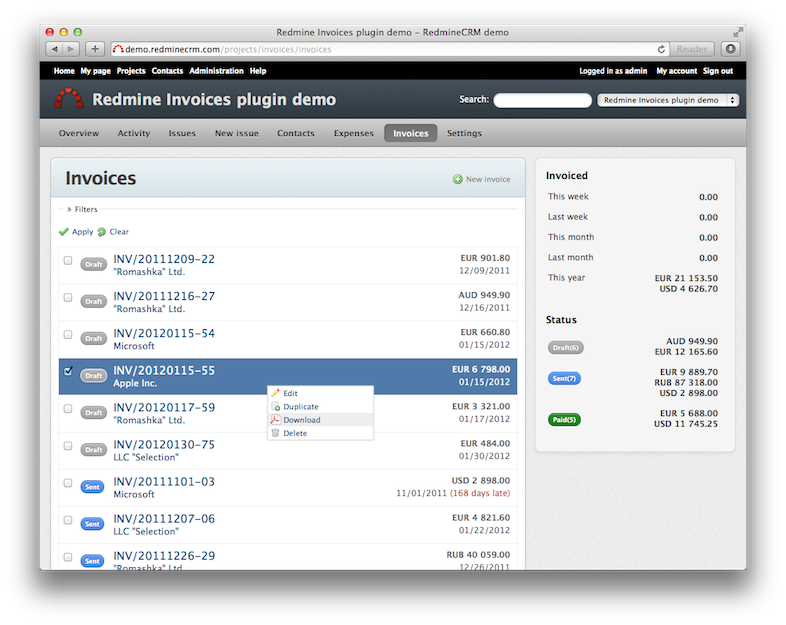 It works well with “Finance” plugin allowing you to link operations and invoices. 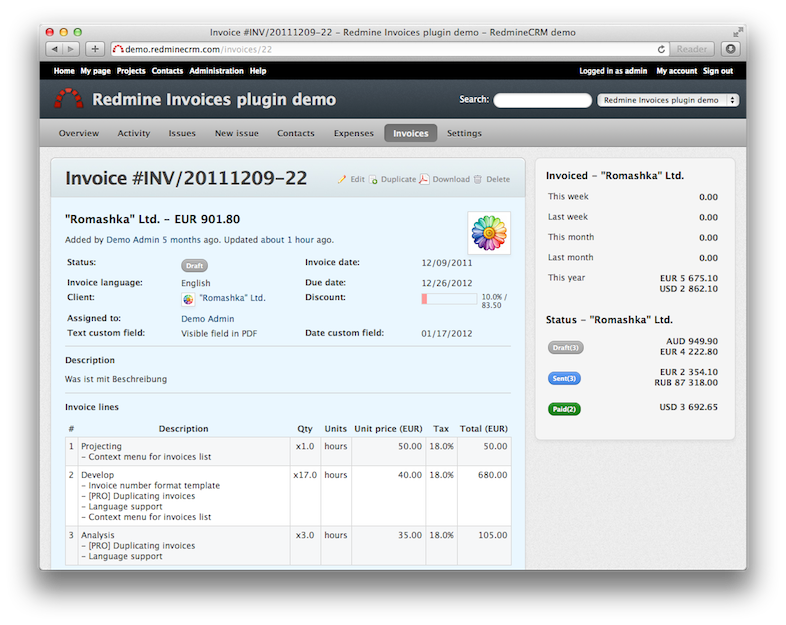 With “Invoices” plugin you can bill standard Redmine time entries with your custom rates and group invoices’ entires by activities, users and issues. This is especially convenient if your organization provides time-based services for the clients, e.g. software development companies, design studios, customer support departments and others. Expenses enhance the standard invoices functionality and allow to keep track of the additional non-time based investments made during the project for you and your client. Create draft of expenses and negotiate it with your client or just use it for more transparent accountancy. 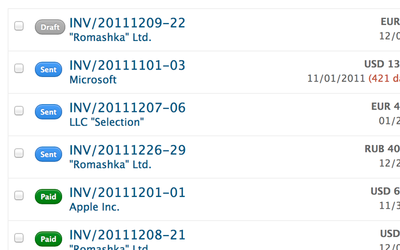 You can set your invoice in one of 19 languages contributed by the community. To start just include your company logo, company information and custom fields to PDF report. 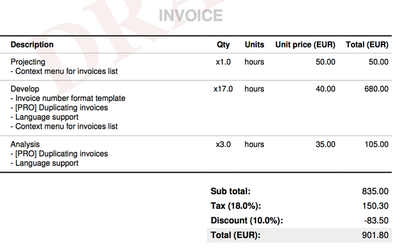 Choose one of 4 predefined professional PDF templates, or create your invoicing template. With HTML based custom templates powered by Liquid markup language, it is simple and easy. What is more, each report has a link to a public view, that allows to see it without signing in to a system. With Helpdesk Widget your employees & customers can send inquiries or set tickets from any page inside Redmine or external. What is more, you can customize fields you want to be displayed, as well as pre-populate them with a content. It includes the use of address of a page, status, product ID and more. 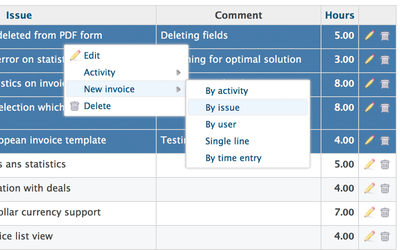 According to your need, you can add different positions to invoice in different units. Despite standard currencies, you can add mileage (in miles or kilometers), time entries (in minutes, hours, days) quantity of products (in pieces), or any other that you would find suitable for your organization. 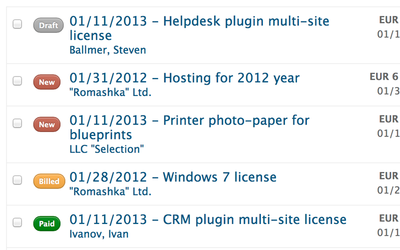 Compatible with Redmine 3.1.x, 3.0.x, 2.6.x, 2.5.x, 2.4.x, 2.3.x. Compatible with Redmine 1.4.x, 1.3.x, 1.2.x. Compatible with Redmine 1.3.x, 1.2.x. 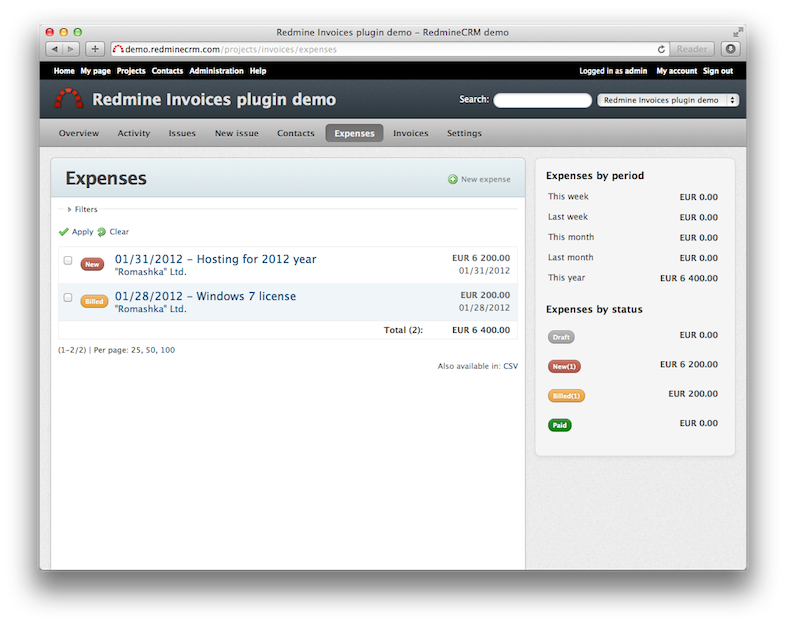 All the invoices we are writing are done inside Redmine with the awesome Invoices plugin. We created together with our designers a custom PDF template and now we can send out just beautiful invoices in the name of cubetech. Thanks RedmineUP! Simple and useful. Easily integrated with Redmine. Good plugin with useful features, well developed. You will also get a professional support by the developers.